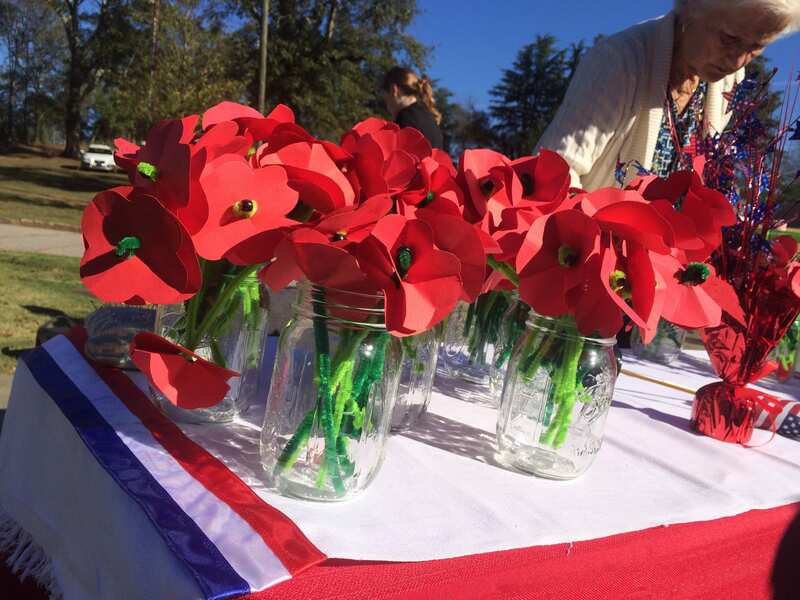 Homemade poppies await guests at the Veterans Day ceremony at Oconee Hill Cemetery in Athens. No flower is more associated with Veterans Day or Athens than the poppy. 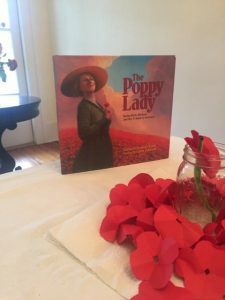 Two local garden clubs educate children on the meaning behind the poppy – the “Flower of Remembrance”. And a woman behind its growing popularity was Athens teacher Moina Michael. Children were read “The Poppy Lady” on Sunday, Nov. 8, 2015. Michael was a UGA professor and wrote her poem “We Shall Keep The Faith” (1918) with a vow to wear a memorial poppy in honor of veterans. When she taught a class of disabled veterans, it inspired her to take action. The selling of artificial poppies was then born. Her main inspiration was Lt. Col. John McRae, a Canadian military doctor during WWI. He wrote the popular poem “In Flanders Fields” in 1915. The imagery of poppies blowing across the white crosses of fallen WWI soldiers became an inspiration in not just America but all over the globe. Today the poppy remains a global symbol for war remembrance. Athens-Clarke County adults and children recognized this and came together to make poppies for veterans on Sunday, Nov. 8. Poppy seed muffins were provided, and the children read a story about Moina Michael. Nan Leathers, who helps run Oconee Hill Cemetery, says that the story is special for children to hear. Moina Michael proves that one person can make a difference. The homemade poppies were on display at the Oconee Hill Cemetery‘s Veteran’s Day ceremony this morning. Children make poppies out of green pipe cleaners and red paper. Everyone listens to “The Poppy Lady”. Children make poppies for Veterans Day. Adults and children listen to instruction. Kids enjoy poppy seed muffins.